A food & activity dairy (F&AD) is an awesome tool to help you change your eating and exercise habits and it’s these habits that are what causes almost all of us to be overweight. In this post I discuss 7 of the best reasons whyif you are serious about losing weight and keeping it off, you really should use this awesome tool. Study after study has found that participants keeping a F&AD lost on average twice as much weight over the duration as those who don’t. Isn’t THIS what you really want – much faster weight loss? And THIS is scientifically valid and not just a crazy fad that you won’t sustain! Losing weight and changing your lifestyle is a journey, and it’s your journey and not anyone else’s. To transform how you look and feel, its your behaviours and thoughts that need to change, and to keep with the journey analogy, we have to establish precisely where you are starting from. This means finding out what you do currently, the good and the bad, so you can then decide what specifically to change, so that you know exactly where you need to focus to get the best results. Often people have the thought – “I’m going to eat healthier” but this is extremely vague, and is very very hard to measure success, and it often doesn’t result in weight loss. The brain doesn’t do well with vague – it tends to find loopholes and in this example, loopholes tend to mean you don’t lose weight. People need to focus on specifics, such as: at mid afternoon snack I am going to swap an apple for my usual chocolate bar. This is easy to measure, and will make a difference to your results. This allows you to know exactly what to do! So use your F&AD to document and monitor the specific changes you want to make. Often people KNOW what they need to do, but they simply lose focus on themselves and their own personal goals as life gets in the way. Developing the habit of filling in a F&AD, shows and reminds your brain that your health and wellbeing is important too, and when it keeps getting reminders from you it starts to get on board and remind you back! It actually starts to look for ways to be more healthy and get more active. A F&AD really helps you keep your goal front and centre, and it’s THIS probably more than anything else that will make the biggest difference to you achieving a body you can be proud of! F&AD’s help you stay on point! Often something that looks like it’s the problem is upon closer inspection, not the problem but actually a symptom of the real problem. And if we are looking in the wrong place for the solution we will never find it. This might seem like the problem for a lot of people, but often upon closer inspection, this person is often eating far too little throughout the day because they are trying to be “really good”. When the person gets home, having used up all their willpower and not given themselves enough of what their body needs, their hormones take over. The part of the brain responsible for helping them stay focused on their longer term goals goes off line and a subconscious eating habit takes over to take care of a immediate (and often unconscious) need. It’s a lot like a faulty autopilot taking over again and again, and this particular autopilot crashes your best intentions straight into a hillside and any hope of achieving your goal weight goes up in flames! Once the need has been met, the faulty autopilot then disappears, your future based mind comes back on line and you are left thinking – why do I keep doing that? So completing a F&AD can help you (and your coach if you have one) uncover some of the under the surface stuff thats really going on, driving behaviours you’d love to stop! We don’t actually need to be at our target weight to start to feel better. Seeing that we are doing better than when we started is a great way to get that extra boost of self belief, and a F&AD lets you look back to see how far you’ve come. Recording progress is a great way to challenge the inevitable negative self talk that comes up for most people when they are feeling low. You can see the evidence for yourself. It’s part of the weight loss / lifestyle change process to go off track – it’s completely normal. Filling in your F&AD is a process that helps you recognise when you are off track, and can then bring you back focused on your goals much quicker than if you aren’t completing it, and this means you lose weight faster. It also means you spend less time feeling bad and thats a massive win in itself! So these are my top 7 reasons why as a weight loss coach I love food diaries. I hope you found this summary really useful, and that I’ve convinced you to give it a go. I’d love to hear what you think of this post and what your experiences of completing a food diary has been like – good and bad. 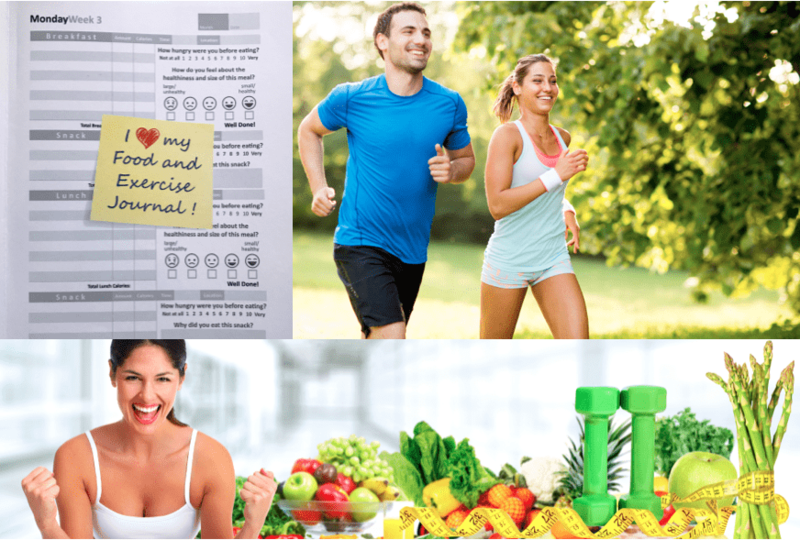 And finally, look out for my next post which will give specific instructions about how best to approach completing your food and activity diary. How you approach completing it can often make a huge difference! Ps – Remember You Get Twice As Much Weight Loss By Doing This ONE Thing!